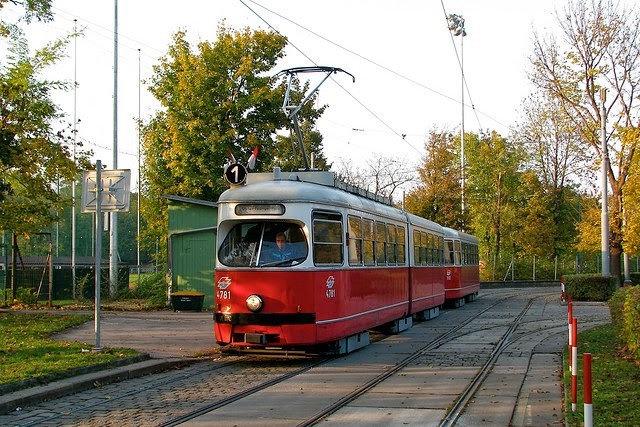 Here's a run that takes you along one of Vienna's most popular running routes. 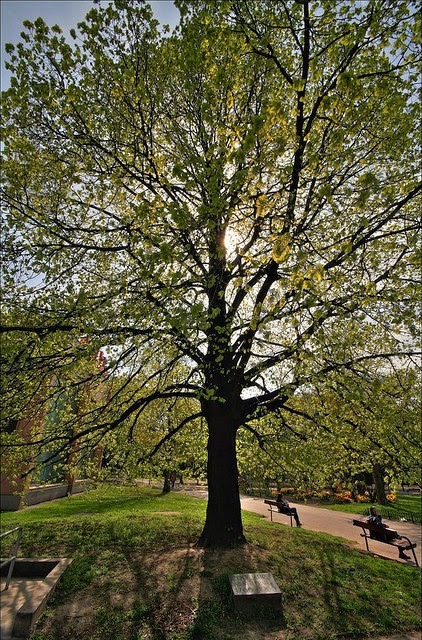 The Prater is a long, green stretch of parkland between the old town and the Danube River. It's a woodsy area that is always worth seeking out for a run through some of Vienna's finest scenery. 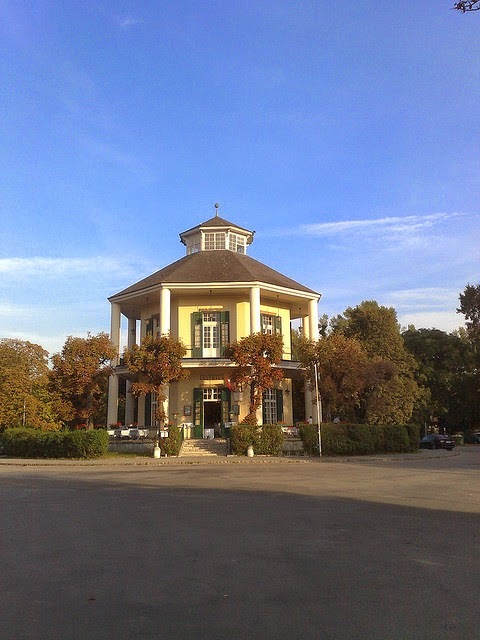 The Prater was once a royal hunting ground that became a public park 250 years ago. It's filled with a lot of interesting stuff, and is home to many of the city's best sporting and recreation grounds. It has lakes, woods, lawns, cafés, playgrounds, an amusement park, a football stadium (Ernst-Happel-Stadion, the biggest in Austria), Vienna's trade fair, a 4-km-long miniature railway, a planetarium, a horse-race track, swimming pools, and bike-, horse-, skateboard- and in-line tracks. And, I should add, running tracks. This route heads through the main part of the park and then back again, beginning at the Praterstern. Praterstern is just a couple of kilometers northeast of the old town, a traffic circle where seven streets come together. A train station occupies the middle of the circle, including an U-Bahn station (U1 and U2 lines service it), making it a good place to start. The run is basically an out-and-back along the Prater Hauptallee. This pedestrian street is 4.5-km long, and cuts through the main part of the park. Hauptallee follows a straight line to the Lusthaus, a café at the southeast end of the park, which is a favorite destination and hangout for many park visitors. We could run even further, past the Lusthaus, through more woods and lakes, but I figure that 9.4-km is long enough already for this route. There are instructions below, though, on how to extend it, if you prefer. Hauptallee is basically a long, straight pedestrian/bike street, lined by trees. To each side are narrower trails for horses and pedestrians. You can choose to run on the pavement or off on the smaller, softer pedestrian trail, avoiding bikes and in-liners. Start the run: At the Praterstern Station, turn to face south. You'll see a pedestrian tunnel going under the circular street called Praterstern. Go through the tunnel. When you emerge on the southeast side, you're heading straight for the big Ferris wheel at the amusement park, with the domed planetarium in front of it. Turn towards the right at the planetarium to hit Hauptallee, where you continue running diagonally southeast for the next 4.5 kilometers. At first, you'll pass the amusement park on the left side, and the roller coaster. 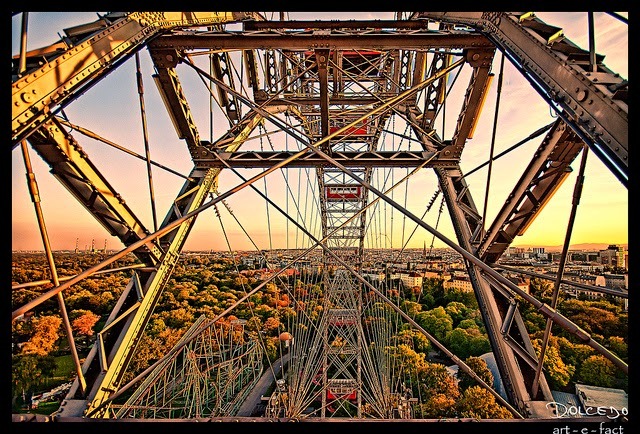 The "Venice in Vienna" amusement park was built in 1895 (referred to by the locals as the "Wurstelprater"), with its famous 120-year-old Ferris wheel. Just past the amusement park, you run past the exhibition center, also on the left side, site of a world's fair in 1873. Then you'll run past various sports fields to either side: soccer, tennis, even baseball fields. 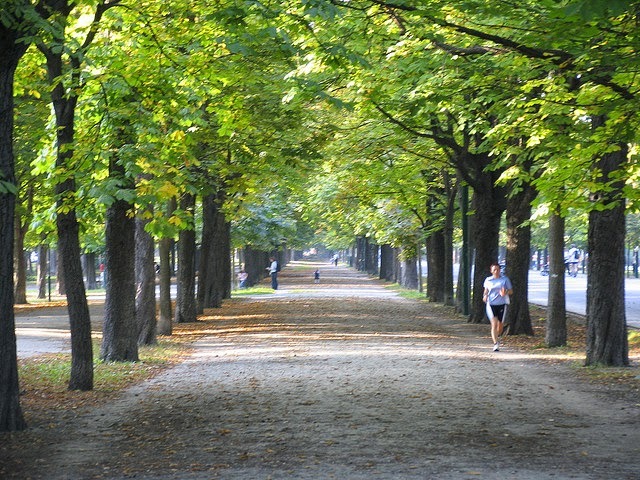 Right after the baseball fields, you'll cross Kaiserallee, at the 1-km point. This is also the end-station for Tram Line 1, another possible way to get here, and it follows a very scenic route along the old-town ring. After the sports fields, you'll enter a woodsy area, with forest to each side. You might see the mini-railroad trains puffing along their tiny tracks to the left side of the road. 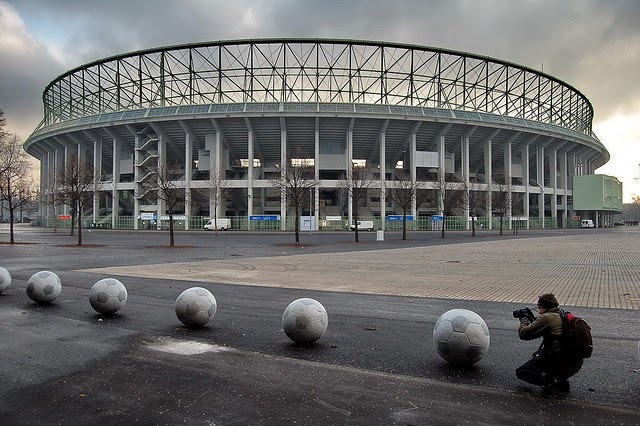 The railway parallels Hauptallee till the stadium. Then comes the big, round stadium, on the left side, at the 2-km mark. Across from the stadium parking lot, on the right side, you'll see a narrow lake curving off, the Heustadelwasser. Just to make the run a bit more interesting, we'll follow the crescent curve of this lake until it joins back into Hauptallee 1.7-km later. So turn right and follow the path along the banks of the Heustadelwasser, which was once an old arm of the Danube. After the 3-km mark, you'll go under a loud Autobahn bridge, which unfortunately bisects the park. But soon the park will get quiet again, and at the 3.7-km mark, the lakeside trail joins into Hauptallee again, where you turn right and continue running southeastwards. After going under a railway bridge, you'll arrive at the round Lusthaus café. Circle the building and head back towards the start, along Hauptallee again. NOTE: If you want to see the rest of the park and extend the run by another 3 kilometers, you can head east from the Lusthaus along Schwarzenstockallee towards the pond called Krebsenwasser, circling the south end of the park, and returning northwards to the Lusthaus along the shores of a couple of more small lakes, with the Vienna Golf Club to the left side. This time, when you reach the Heustadelwasser again, run along its other shore. When you return to Hauptallee at the stadium parking lot, continue northwestwards back to the Praterstern. Not a bad run, eh? The Prater is worth coming back to again.